Reading Bavetta’s newest collection is like wandering through a retrospective of a woman’s life. Her writing is quiet, thoughtful, and thought-provoking. Many of the poems have flashes of subtle humor, making the reader feel as though she would like to become friends with the speaker.There are understated layers of meaning in poems depicting an event which, on the surface, appears ordinary. In “Self Service,” a buffet is described. Every line of this poem is a metaphor for life. In the beginning, the speaker is faced with heaping platters of food, implying that all of life is there for the taking. However, one might wish to exchange a hasty choice, to “slip my first husband back/among the lemons.” The poem ends with these lines:	Now	the line in front is shorter	than the line behind. I’m getting closer to the end,	to the place I’ll have to pay	for everything	that’s on my tray.Bavetta is a native Californian, and her love of her state drives much of her writing. Give me someone who sings of golden hills	dehydrated under an August sun, of sage	and chaparral, eucalyptus and red-tailed hawks,and crummy motels hooded with bougainvillea. (Oranges and Pomegranates)With a deft turn, a significant detail is quietly inserted into a brief poem. Bavetta is a master at this. Dry as touchwood	the canyon in flames	grass crackling	no firebreak	smoke boiling	roiling into a sky	of meaningless	blue	the biopsy	results	all afternoon ashes	fall	into my garden. (Brushfire)Although “Elegy for My 1958 Volkswagen” was a strong contender, in part due to fond memories of the Bug I had in college, the poem I keep returning to is “Den Norske Amerika Linje,” in which the speaker’s husband has a recurring dream of his frantic departure from Norway to America. Fort deg, fort deg, hurry,	hurry, my beloved. You must	be on board the Stavangerfjord. You must come to Amerika	and find me.I am so glad I found Ruth Bavetta’s wonderful poetry. One of the best books of poetry I've read since Bavetta's Fugitive Pigments came out last year, Embers on the Stairs is the product of a mature talent in command of her craft. In our youth-obsessed, sexist culture, it's a treat to read "Ode to Menopause." The writer exults: "no condoms, no jelly/no pills, no diaphragm/no fruit of desire/but desire itself." As a New-England-educated Californian, I appreciated the declaration in "Oranges and Pomegranates": "I'm tired of hearing about weathered barns/and cows and icy Vermont winters.... Let me see Latinos in white straw hats selling oranges/at the freeway offramps while ghost coyotes nip/at the tasseled edges of the city. "Other favorite poems of mine included "Fishing Lesson," "Self-Service," "The Acrobatics of Desire," and "Low Tide." "Fishing Lesson" describes a painting-like coastal scene from multiple perspectives and using most of the senses. In "Self-Service," in which the poet compares her life to a cafeteria line, she wonders, "Can I slip my first husband back among the lemons?" "I'm getting closer to the end," she writes, "to the place I'll have to pay/for everything/that's on my tray." "Low Tide" returns to the beach, gorgeously describing the minutiae of the tide pools that we coastal Californians love. "The Acrobatics of Desire" signs off, "When I take my bow, the shattered stars/gleam and twinkle in the spotlights. Far below,/the crowd applauds, but I'm not afraid of them./I have the power of the lost wax wings." This reader is applauding. Many enjoyable poems and several killers (such as "Addictions" and "Let there always be"). My favorite lines are from the poem "Requiem for July":If water is loneliness,I am a swimmer seeking stars.Hell, yes! These poems spoke to me, particularly since Bavetta is close to my age, lives near the ocean, and has an artist’s eye for creating memorable detail. I had too many favorite poems to name, but especially enjoyed “Elegy for my 1958 Volkswagen,” the poem Rattle quoted as an example of what makes its editor accept a poem: “Four cylinders chugging/in the rear, it was like being chased/by a busy washing machine.” Bavetta balances humor and pathos, sometimes in the same poem. In “The Oracles,” she presents three doctors who come into an examination room to discuss her treatment options for breast cancer. Doctor three “bounds into the room” and announces, “The good news…is that [she does] not have cancer.” Reading the pathology report again, he adds, “Oops, ...didn’t see that part.” Here is a woman of experience who is willing to share her vulnerability, heartache, and triumph so that we can look a bit more objectively at ourselves. I've been allowing myself one or two of these poems a day for a while because they are so evocative and speak to me in layers. Now that I have I have finished, I will go back to the beginning and start again. This is really an outstanding collection. A second book by a talented lady. She reaches into your heart with her simplistic look at the surrounding world. She shares moments of triumph , sadness and victories of her life. A wonderful uplifting collection of poetry. In her cover blurb for this book, Lisa Cihlar says "Ruth Bavetta's poems are clever. But that's okay . . ."And they are clever and it is okay. But I would use another term. I'd say the poems in Embers on the Stairs are irreverent.There's Bavetta's take on breast cancer consultation, for example, in "The Oracles"The first doctorhas a fine head of white hair.He says the only cureis to cut it all off.. . .The second doctor says. . . whichever I want.What I want is to run . . .Doctor number threebounds into the roomin purple pants and tennis shoes.. . .The last doctor looks youngerthan my youngest son . . . Or "Settling Accounts' that begins He has a mouth like a bankbook and endsWhenever he sees me, he looks up from his ledgerand hands me a paper clip.These slightly rueful poems make us chucklee with recognition of the absurd, even at that most frightening of diseases, and then marvel at their insight.But Bavetta is also capable of expressing a darker mood with a striking image as in "The Midnight Horse," whichgallops through the night,his hoofs striking starsagainst the black,his breath smoldering.. . . Eight years it's beensince I came to this place,riding on the backof cells gone wild.Or "Disorder"He hangs between lithiumand Depakote, the bonesof a bird balancedon the awful noise of flight. Or "Afghanistan"There is only this stain,only this growing fist of poppies, only these birds that gainthe cliffs of winter.Many of the poems in this collection are short, with a haiku-like clarity. On first reading some of them might seem merely clever. (Though I have to say that I have a soft spot for cleverness myself.) But on second reading or third, we see that they are also, as Cihlar continues "heartbreaking and universal and astonishingly good." Ruth Bavetta - Ruth Bavetta was a visual artist for many years until she realized she also wanted images that could be painted with words. Her poetry has been published in Rattle, Nimrod, Tar River Review, North American Review, Spillway, Hanging Loose, Rhino, Poetry East, and Poetry New Zealand among others and is included in the anthologies Twelve Los Angeles Poets, Wait a Minute; I Have to Take off My Bra, Pirene's Fountain Beverage Anthology and Forgetting Home:Poems about Alzheimer's. 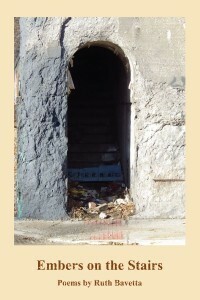 She has published two books, Fugitive Pigments (Futurecycle Press), and Embers on the Stairs (Moontide Press.). A third book Flour, Water, Salt, is forthcoming in July 2016.Her art has been shown nationwide. She loves the light on November afternoons, the smell of the ocean, a warm back to curl against in bed. She hates pretense, fundamentalism, and sauerkraut.